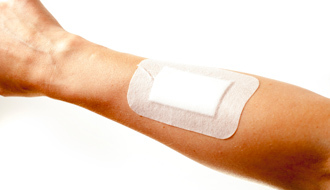 For small burns on limbs or trunk, we can usually help dress, clean the wound and reduce risk of infection. A&E is recommended for larger burns, chemical burns, burns on children or burns to the face. Burns caused by dry heat (fires, ovens, irons) or scalds caused by hot water or steam are best treated by a professional, who can evaluate the seriousness of the burn and help you heal as quickly as possible. The burn will be assessed depending on how deeply the skin is affected – a minor burn extends just to the epidermis. The deeper layers of dermis and subcutaneous fat may be affected if the burn is especially severe. Typical symptoms of a burn are pain, blisters, redness, and peeling, charred, white, or swollen skin. Sometimes a more serious burn may be less painful than a less serious one, depending on whether the nerves have been damaged. The doctor will evaluate the size and extent of your burn, clean, and dress it. If the burn is very serious, we can advise you on next steps, including skin grafts and other surgeries. What are some immediate care tips for burns? Please seek medical attention for a burn as quickly as possible. In the immediate aftermath, run the burn under cool running water. Avoid applying any creams. You can cover the burn with cling film or clean plastic. I have a blister following a burn. Should I burst it? It is not advised that you burst a blister on your own, as this can cause infection. The blister is actually protecting the skin and keeping it clean whilst it heals. If it is especially painful, a doctor may be able to lance it for you. When should I seek emergency attention? It is advised that you seek emergency medical help if your burn is chemical or electrical, if it is especially large or deep (bigger than your hand), has caused charring of the skin, or if it is on your face.